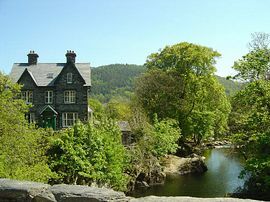 Beautiful centrally located Betws-y-Coed Riverside B&B. Stunning View of 550 year old Stone Bridge and River Llugwy. This very popular centrally located Betws-y-Coed Bed and Breakfast, sits on the bank of the River Llugwy and enjoys stunning views. The superb location is complemented, by bright rooms with wonderful views, from the dual aspect windows in all guest rooms. Rooms are all en-suite or with private facilities. There is a Private Car Park and Free Motorbike/Bicycle storage available too. Walkers can take advantage of the Drying Facilities and Free Wi-Fi access is available to all guests. It's the perfect base for exploring - so you may say it's in the middle of everywhere! Double or Twin en-suite rooms are available from: £30.00 per person, per night, based on two sharing and includes breakfast. 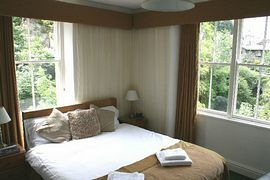 Single occupancy of a Double en-suite room is available from: £50.00 per night. Mar. to Oct. most days. Nov. - Feb. most weekends (closed most weekdays). Special Diets Provision: Special diets are not catered for. 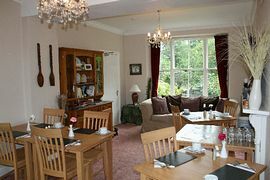 Hearty cooked breakfast and cereal available, as well as Vegetarian cooked option. All other diets catered for with advance notice. The owners website has Guest Reviews, from their comments books, as well as links to online reviews made by previous guests. Entering Betws-y-Coed via A5 from the East (e.g. from Corwen). Enter Betws-y-Coed by travelling over the Waterloo Bridge. Continue straight along the Holyhead Road (A5) past The Royal Oak Hotel. Look for the Hawkshead shop on your right and take a right turn onto the Pont-y-Pair Bridge. Bryn Afon is the first house on your right and the Car Park is at the rear of the house. Entering Betws-y-Coed via A5 from the West (e.g. from Bangor. 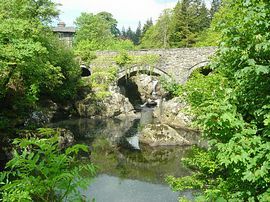 Enter Betws-y-Coed by travelling past The Swallow Falls Hotel. Continue straight along the Holyhead Road (A5) past The Cross Keys Hotel. Take the next left onto the Pont-y-Pair Bridge, just before the Hawkshead Shop. Bryn Afon is the last house before the end of the B5106. Our Car Park will be on the left just after you pass Swn-y-Dwr Guest House. 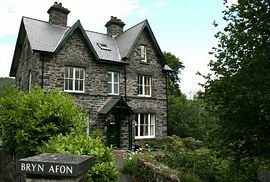 Bryn Afon is just a short flat walk (less than 10 minutes at a modest pace) from Betws-y-Coed Train Station. The nearest Bus Stop is outside the Royal Oak Hotel which is just a few minutes walk from Bryn Afon.